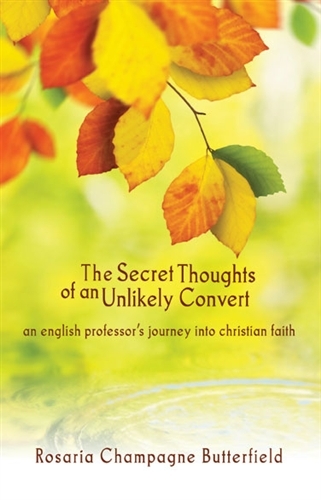 I've bypassed reading anyone else's reviews on Secret Thoughts of an Unlikely Convert : An English Professor's Journey into Christian Faith because I knew I wanted to read it for myself. I finally bit the bullet and purchased a copy to read. It arrived in the mail and I sat down and read it by the next day. It is one of the most compelling books that I have ever read as relates to the way people live out their Christian faith. I am left to strongly recommend that all Christians everywhere, especially those that label themselves "conservative" pick up and read. To tell the truth, I found myself crying frequently (sometimes it was more like a sob) while reading this book. Butterfield's story, in a nutshell, is that she was a tenured professor at a large university in New York state, heavily involved in gay and lesbian studies and in promoting leftist political positions. She herself was a lesbian, heavily ensconced in the lifestyle. She outright rejected God and feared "His people" who opposed her life in every way one can imagine. And then, one day, God called her to Him and, as she said, it was a train wreck. Her life was suddenly turned upside down and everything she had ever comfortably known was removed from her as she began to explore exactly what it meant to follow Jesus Christ. This book may, in fact, sound like a simple conversion story. However, it's the sort that catches the attention of Christians who have long believed that homosexuality is a great threat to our nation in general and marriage as God designed, specifically. So it is with some great curiosity that we (myself included!) feel compelled to pick up this book and hear Butterfield's story. When I picked it up I expected to hear an amazing story of how God got Rosaria's attention and brought her to repentance and how she is now "living for God!" And yes, it is that. And oh, so much more! The incredible thing about this book is that the reader picks it up thinking it is all about Rosaria, only to discover that it's really all about themself. Rosaria has confessed her sins honestly and she claims to have new and present sins which still require her vigilent attention and dependence on Christ. I'm going to bet that most of the readers of this book are less honest with themselves and with God than the author of this book is. I include myself in that statement. Whether she is discussing her sins then or her sins now, she continually goes back to scripture in examining everything. She does this in a manner which is not at all abbrasive. As you might guess from her past history, she is the intellectual type and so every belief she holds to she has studied and determined to believe after much time and thought. The one thing she does require from her readers is that they put their brains to work and think through what scriptures teach and what their common Christian practices say about God. In asking for minds that reason, she is neither arrogant or demanding. Rather, she is compelling and full of grace. I have seen people pick out a variety of themes from this book, most commonly the need (and present lack!) of true Christian hospitality. Butterfield does indeed make an argument that we are called to serve the world, not save it. As she points out, only God can save someone. We who lack the power to save have been told to serve and she lays out her scriptural argument for this. In reading this book one can easily ascertain the reason why it is better to serve the lost than try to save them. They don't understand our lingo! Bumper stickers and billboards display words that don't make sense. Inviting someone into your home, serving them a meal and allowing them to feel your love does. One reason I really appreciated this book is that she takes the time to explain how Christians "come off" to the world at large. It's startling and striking to understand how we Christians typically view ourselves and how the world sees us. It's worth some thinking over. Other themes and discussions which can be drawn from this read: the lack of education in Christian circles. She points out - in a painful way, really - that Christians are notably unintelligent. Afraid to think hard thoughts and think through arguments and do the research necessary to back up our faith and other opinions, we are greatly disrespected. It's important to apply the brain and engage with arguments in an intelligent manner. I fully recognize that this is hard to do because learning things takes time and we frequently feel the shortage of such a commodity. Still, knowing what the Bible really says and/or requires on any subject matter at all is worth the time. She gives a proper chastisement to laziness. Ouch! Now, she doesn't site a Bible reference for her opinion but that does not make it invalid. (I do appreciate that she notes that it is what she thinks and not what the Bible says - at least in so many words.) This is definitely an area that I struggle with. On the one hand, I do wish to protect my children from harm and so there is a limit as to what we will expose ourselves to as a family - especially when our children are quite young. However, in those feelings there is the danger to seperate myself even from members in the Body of Christ who I have been called and charged to love and serve. Different isn't always easy. But then again, we weren't called by God to form small cell groups of Christians made up of people who are identical either, now did He? The Bible is quite explicit in stating that all the members are different and that this little fact should not surprise us. Rather, the differences appear to be necessary in order to help the Body function as it was designed to. And if God said, "You're GOING to be different" then it does seem a little silly to say back to Him, "Well, I don't really care for your plan. You clearly didn't have my children in mind for this particular time in history." That does sound like prideful arrogance when I write it out. Ouch again. The fantastic thing is, as convicted as I am by this, she spends the whole book not excusing her sins and prior worldviews but confessing them and submitting them to Christ for repentance. She works to be obedient. So if I read this book than I have to ask myself how hypocritical I am being in my faith and where God wants to convict and make changes in me. As she asks a few times, are her sins of the past greater than those of the present? The obvious answer being no, they are not. We are each being conformed and transformed and the work is ever ongoing. For her. For me. For you. Until we die. There are so many thoughts packed away in this amazingly little book. I can't recommend it enough. I could go on talking about it for a long while. But to summarize: I really think you ought to read it. Wow, when you said the book was worth buying on a Kindle I nearly got chills. ;) It does sound very interesting, and I think in the near future I will read it. This little book does pack a big punch, doesn't it? I found myself convicted on many points as well. A former pastor who is now a teacher has been speaking at our church the last several Wednesday nights. He didn't seek out a ministry engaging with atheists but somehow it came upon him, and he has been sharing a lot to think about. He mentioned as well that one of the biggest problems with Christians engaging the lost is that we haven't done our homework and don't know what we're talking about and think we can influence others with catch-phrases and anecdotes. Plus we tend to go into "attack mode," especially with certain types of people, instead of trying to share Christ with them. Wow... this does sound like a really thought provoking book. I'll have to keep my eyes peeled to find it at the library. It's at my house and currently going through my family. I think I might be in line next to read it. Can't wait! Good review. This does sound interesting. This past year I have realized the benefits of Christian friends with different convictions. I want to read this! I'd never even heard of this book! I just added it to my non-fiction line up, though. A good friend sent me this link, saying she thought I'd really enjoy the book. On the one hand, your review makes it enticing. On the other hand, I'm reluctant. It's so tiring to be a lifelong Christian and have it insinuated that I'm bigoted, narrow-minded, homophobic, and blah, blah, blah. Concerning the reference of "God says..." I'm not sure people say that to attempt to end the conversation or trump the reasoning of others. I think in many cases the speaker actually believes God is the author of all life, the Bible is His inspired Word to humans, and if we want things to go well, we'd be wise to listen and obey His guidance. However, non-believers have become mostly intolerant of hearing what God has to say. Because it was shoved down their throats for so long? I don't think so, because most non-believers know very little of what the Bible has to say. In fact, since the 1960s cultural revolution, Americans largely don't want anything presented which carry the expectation of giving the throne of your life to another. And the point about Christians associating only with like-minded people and having a closed culture: I think that is largely true, but no more so than any other group. Blacks tend to congregate with Blacks, Latinos with Latinos, liberals with liberals, conservatives with conservatives, alcoholics with alcoholics, ad infinitum. I'll probably end up reading the book, but I must say I'm pretty tired of being condemned for who and what I am simply because it doesn't fit the mold of another's expectation of what they think I should be. I love that you finally read this. I agree with you that the book makes the reader examine self--challenging and so very well done. So masterfully written!